When we first started potty training Jude we implemented the potty chart, it had minimal success. He isn’t really motivated by a piece of candy or the promise of a new toy. He really could take it or leave it for the sake of what’s easiest. However, over the last few months we’ve started learn what motivates Jude. It’s not candy, food, toys or stickers… he wants experiences. Most specifically he wants to play Lego Star Wars Video Games with his Dada. So we are reinstating the potty chary with the reward of playing a video game with dada. After several rough days riddled with potty accidents we were at our wits end and decided we needed a new plan of attack. 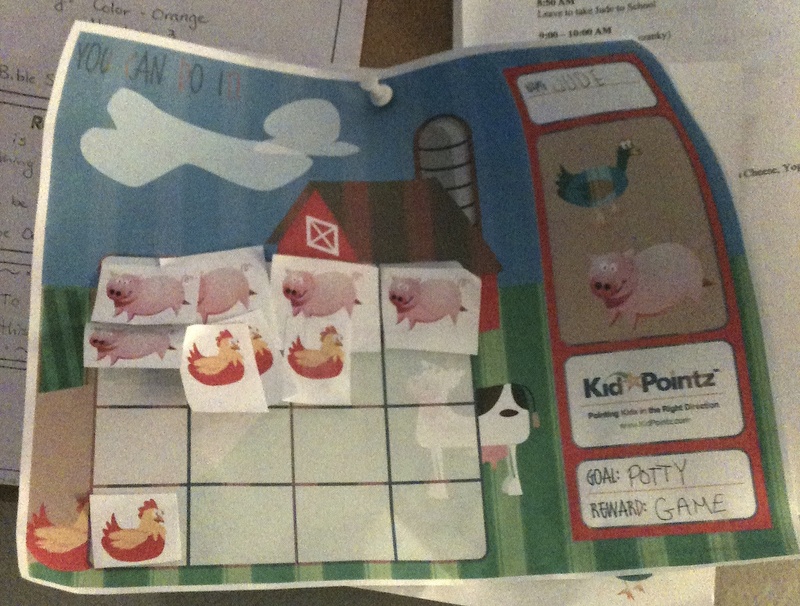 He specifically requested a farm potty chart and is very specific about which stickers he gets. Whenever he uses the potty (without making a big fuss about it) he earns a sticker. When his chart if full he has earned the opportunity to play a video game with daddy (on the weekend). So far we’ve seen vast improvement, primarily in his attitude toward using the potty. His biggest struggle has been making the “time” to go potty. He gets so wrapped up in whatever he’s doing that he doesn’t notice he has to potty hence all the accidents but when we call him out he screams in denial. While he still isn’t fully acknowledging when he has to go potty yet using the potty chart has drastically cut down on the number of tantrums we have each day. Did you use a potty chart? If so what kind of incentives did you use? haven’t tried the potty chart yet, it is a good idea! He is still a little scared so we are waiting a bit until he feels comfortable. It is hard when they are playing and just get so involved in what they are doing and don’t make it. When we start the potty chart, I think we will be looking for the different rewards, such as a movie night that he gets to pick the movie and snack. Thanks for the tip on the potty chart.